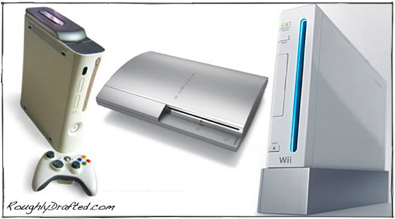 Difference and similarity between Wii, XBOX & PS ? The Sony PlayStation 3 and Nintendo Wii both jumped into the game console ring to compete against Microsoft’s Xbox 360. Who is going to win? Everyone’s watching to see how this battle plays out, because each company is pursuing a very different strategy. Sony and Microsoft are gunning for pure performance systems, while Nintendo is shooting at fun, playable games that rely more on its unique controllers than impressive graphics hardware. Sony’s PS3 is the most expensive at $500-600, because it includes a standard hard drive, a high definition Blu-ray optical drive, HD video output, Bluetooth wireless controllers, and–in the premium version–WiFi wireless networking. Sony is setting up the PS3 as a PC alternative. Sony originally announced plans to ship the PS3 with Linux pre-installed, but currently user installation of “another operating system” is only a boot option. The PS3 is also the new HD core of Sony’s modern take on the stereo system, offering 5.1 Dolby Digital Surround and true 1080p high definition video playback from prerecorded Blu-ray movies. Introduced last winter, Microsoft’s Xbox 360 is $300-400, uses a standard DVD optical drive, and only includes a hard drive and wireless game controller in its premium version. Microsoft recently updated the 360 to provide support for full HD, 1080p video output to match the PS3. Rather than positioning the Xbox 360 as a standalone PC alternative, Microsoft pairs it with its plans for Windows Media Center, allowing the 360 to be used as a media extender to stream music and movies from a central Media Center PC. Microsoft has plans to offer HD movie playback both with an optional HD-DVD player in an external box, and over the web through its online Xbox Live video store. However, the Xbox 360’s optional, external HD-DVD player is $200, pushing the 360 up to the same price as the PS3. Further, the $300 core Xbox 360 systems can’t use Microsoft’s online video store because they don’t have the required hard drive to save downloaded movies. The Wii is the least expensive of the three at $250, and includes both Bluetooth for wireless controllers and a DVD drive, but will not be able to play DVD movies. It also lacks a hard drive. Instead, the Wii focuses on physically involving games using the wireless Wii Remote paired with the accessory Nunchuk controller. The Wii Remote uses accelerometers to sense how players swing, point, and tilt the controller, encouraging game titles to incorporate activity. The Wii will also wirelessly connect to Nintendo’s DS portable game system, using its microphone and touchscreen as inputs for Wii games. While the Wii has no movie store, Nintendo has an online store that sells classic games from the Nintendo 64 and other previous game consoles. So which console is going to assume the lead, or will there be a tie? A half decade ago, many analysts projected a close race between the Sony’s PlayStation 2, Microsoft’s original Xbox, and Nintendo’s GameCube, but their prediction turned out to be wrong: Sony simply blew away the competition with its PS2. This time around however, a number of factors have changed. For example, while Nintendo’s 2001 GameCube was also the cheapest console, its sales were hurt by a game lineup that mainly targeted the youth market rather than teens and adults, something Nintendo has attempted to address. Here’s a quick look at the lessons learned in the last generation of consoles, how Microsoft got involved in console gaming, what resulted then, and what factors will determine how things work out this time. Evergreen Lovers – Love letter of kids! YOGA answers on why females get cooled off faster than males! Actually they are different; you would be able to feel the difference. The right side represents the sun, left side represents the moon. Right side belongs to ‘hot’, so it gets heated up easily, left side belongs to ‘cold’. Most females breathe with their left noses, so they get “cooled off” faster. Most of the guys breathe with their right noses, they get worked up. In about 5 mins, your headache will go. If you feel tired, just reverse, close your left nose and breathe through your right nose. After a while, you will feel your mind is refreshed.